Being told Jax has severe sleep apnea last month was quite a blow. I was sad that he has gone all this time struggling to breathe at night. I was mad it took so long to get the ENT appointment, then wait another 3 months for the sleep study to finally have an answer (the frustrations of free healthcare). I was disappointed that he will forever (or at least for a long time) be tethered to an air hose at night. Irritated that we will have something to lug around with us on vacations and getaways. Most of all I was dreading the process of getting Jaxson to wear a mask strapped to his face at night. 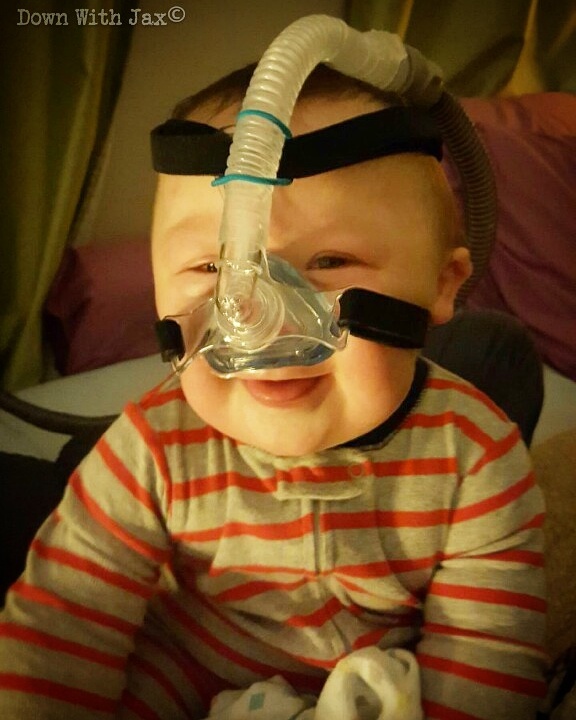 Bedtime pre-CPAP was usually a fight. He would start to fall asleep, then wake up kicking and straining against you. This could continue over and over again 3 or 4 times before he would fall asleep hard. I would then put him in his crib, where he would usually stay asleep for maybe 30 minutes before waking up for the first time. Within the first 2 hours of going to bed he would normally wake 3-5 times. 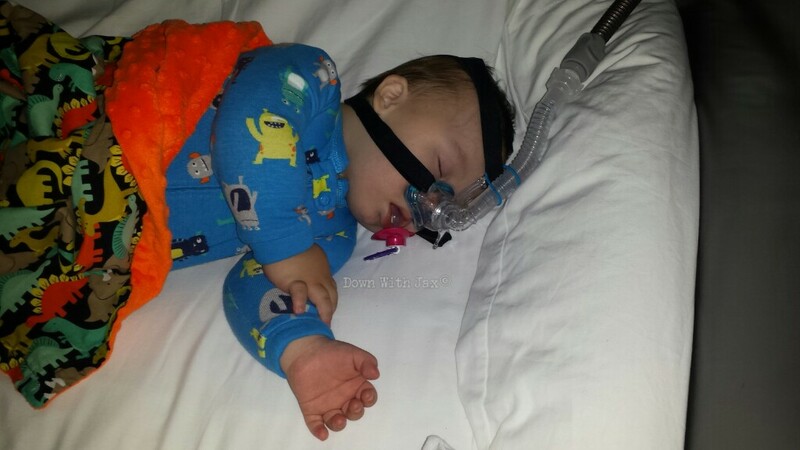 Jaxson never has long pauses in breathing, and his oxygen sats don’t drop. His brain wakes up the second he struggles to breathe, hence the constant waking, crying, and being very unsettled at night. Even though he has never had long pauses in his breathing we always suspected there was something wrong. After waiting a couple of weeks to get the trial CPAP machine, we were anxious to get the show on the road. We still had the GIANT hurdle of sleeping with the mask and air on ahead of us. We were mentally prepared for a very long transition period. Once again, in true Jaxson style, he totally blew our socks off! We started slow. VERY VERY slow. The first week he would only let us hold the mask up to his nose for 3-5 seconds. At this rate I was convinced it would take us months. Then Alex pulled out one of her famous animal impressions! Jaxson thought it was the funniest thing ever to watch his momma hold that mask on her nose and pretend to be an elephant. That sealed the deal for him! 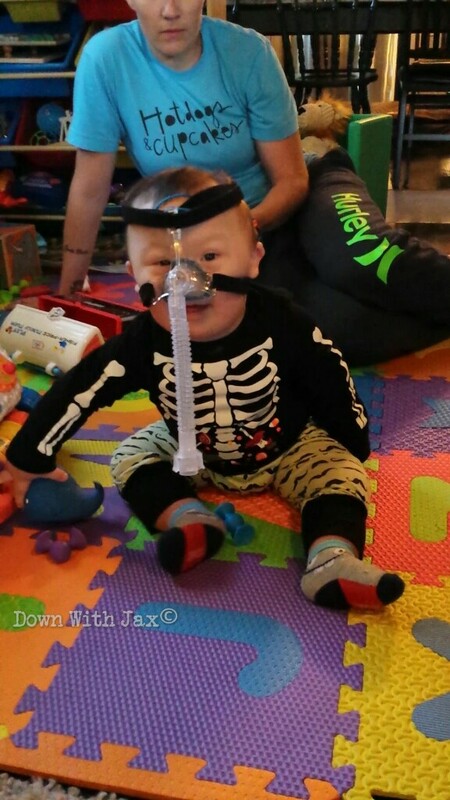 Within a couple days of elephanting around, Jax was wearing the mask fully strapped to his face for 20-30 minutes while playing. After a couple days of getting him used to wearing the mask I started putting him to sleep with it on (no air). Once he was comfortable falling asleep with it, we turned on the air. We were completely shocked with his reaction to the air blowing at his nose. No word of a lie, the second the air hits his face, he closes his eyes, tucks in to me and is asleep in 2.5 seconds flat! I have never ever seen this kid fall asleep so quick! We assumed the hard rush of air in his nose would be bothersome and irritating to him. In reality it’s the exact opposite. The second that strong whiff hits his face he relaxes, tucks himself in to my chest and closes his eyes. The air allows him to breathe when he wants to fully relax to sleep. The air is relief. The air is sleep. And sleep he does! The last 2 nights he has gone 11.5 hours with that silly elephant mask on his face, and boy does he sleep hard! Yes, he still wakes at night. Not as much, and not nearly as awake, but he is peaceful all night long. No more kicking, no more straining, no more constant rolling to try and get comfortable. He can finally breathe easy. He can finally relax. We can all finally sleep!! My initial irritations of having to lug this thing around with us, of having him tethered to a hose all night long have all melted away. I am so incredibly happy and relieved for Jaxson to finally know what it’s like to sleep. I am still very sad it has taken SO long from our initial concerns back in early spring to get his issues sorted and diagnosed, but we have made it here and for that I am happy. Breathe easy big guy, and let’s make up for 8 months of lost sleep! This post brought happy tears to my eyes! What a wonderful relief for all of you.